I was excited when Brinware contacted me to be on the blog again. It has been 4.5 years since I last chatted with them and I was happy to tell them I still use their products everyday! You know they must be great, right? 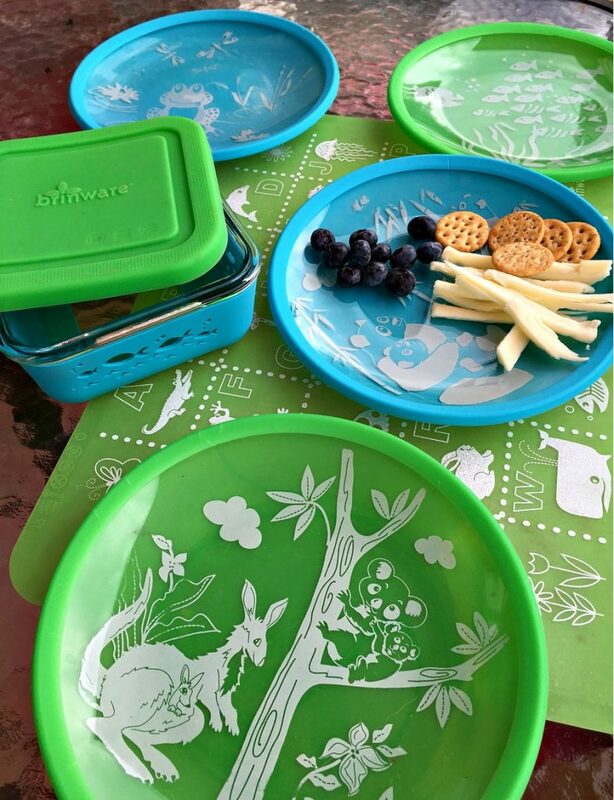 Brinware makes kid friendly glass plates and storage containers, plus silicone placemats and bibs. And they are cute! Bright colors and fun patterns that make everyone smile. Brinware is made with tempered glass, which is heated at high temperatures to strength it – 4 to 6 times stronger! The back layer of the Plates is a silicone shell that does not contain any toxic chemicals. Both materials are super tough and can withstand boiling water. What I love most is the kids can grab them to reheat their own food in the microwave. The plates don’t get too hot to touch and the silicone makes them easy to grip. We use them every single day. Each night they go into the dishwasher to reuse all over again. They are still in terrific shape!! That silicone Placemat is another one of their products. Easy peasy to wipe clean and folds up nicely for storage. A new product to me is the Food Storage Container. Love love love it. Look at those cute fish on the cover. The lid is silicone too which makes the whole thing slip resistant. This can be used in the freezer and the oven up to 400 degrees! The only product I’m not experienced with is the Catch All Bib which has a big pocket to catch all that spilled food. It looks great! Stock up with the discount – affordable, safe gifts for everyone you know! Do you want the kid friendly glass plates, food storage, silicone placemat or bib? WIN any 2 items of choice from Brinware! 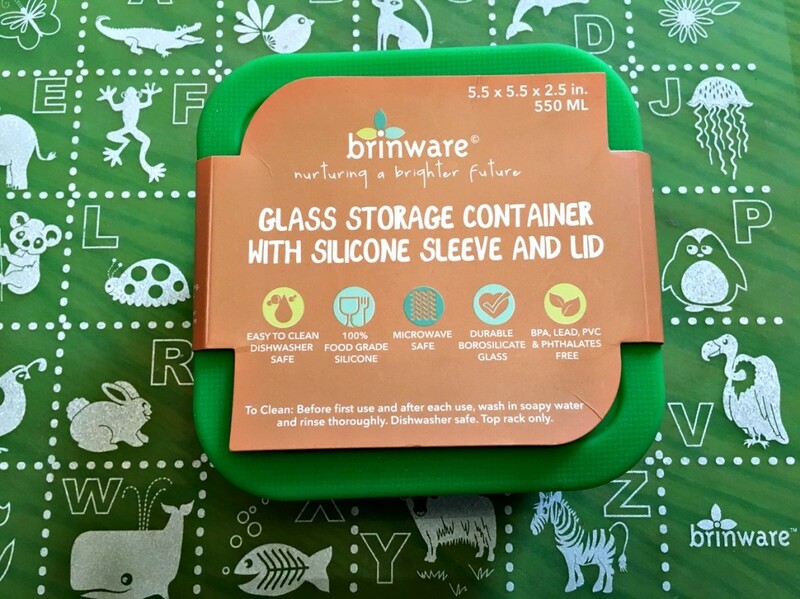 I partnered with Brinware for this sponsored post. All opinions are definitely my own. I would like the Food Storage Container Garden Party. I love the glass storage containers. Looks very durable. I've never heard of this. I would like to try the storage contianers. The Food Storage Container-Garden Party is cute! Besides the plates, I would love to also have the placemats for my grandsons! I would love the barnyard print plates for my grandsons. Super cute! 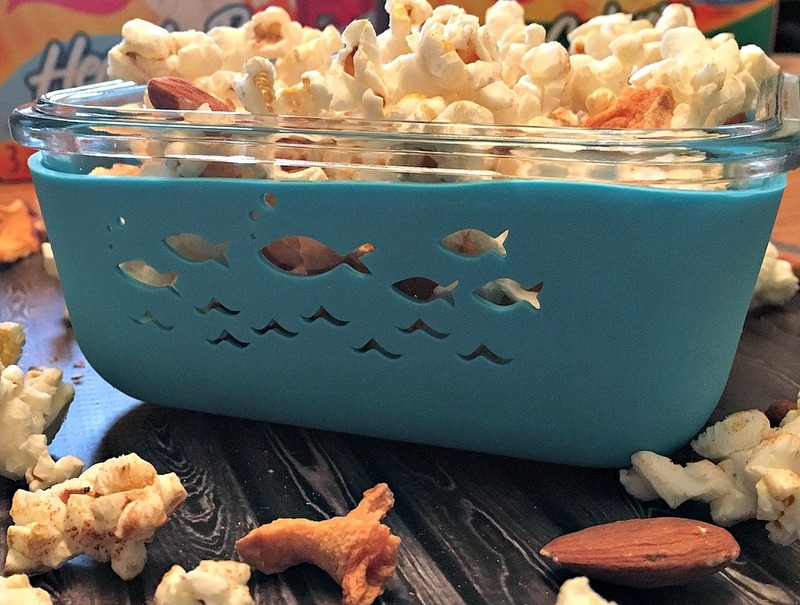 I like the Food Storage Container-School of Fish. I love this concept! My toddler daughter will love the fun prints and colorful ba kings. I especially like Koala and Friends- Pink and Panda Play- Blue for her. I love the It's a Hoot with green and the School of Fish with blue. These are great! I like the storage containers. All their prints are so cute, like the butterflies & barnyard ones the best. I would love to have the Its a Hoot Plates in purple and blue! These are adorable! Such adorable designs! I'd love the Catch All Silicone Bib - Under the Sea. What wonderful products you have found! I like all of them. I would choose 2 plates for the kids in different colors. I would love the multipurpose containers! I love the food storage containers the best. The barnyard friends plates would go over big with the grandchildren. I like the Food Storage Containers. 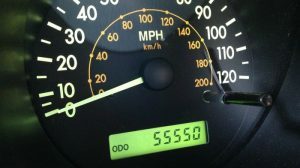 I Just Love the Hoot Plates with the owls.. I love all the colors...Beautiful.. I'd love to have the Garden Party food storage container! It is adorable! I would love some of the plates. I would get both Food Storage Containers. Love both the Fish and the Garden one. I love the 2pack plate set of it's a Hoot and the Fish. I like their containers and could really use theFood Storage Container-School of Fish. I want the School of Fish Food Storage Container. I'd love the plates for my grandchildren. I love that we seem to be moving away from plastic and back to glass. I would love a few of the Multi-Purpose Containers!! I love the plates too! I would like the It's A Hoot- Green. I love the panda play dishes in blue and green. I love the blue/green placemat set! I would also like the Catch All Silicone Bib - It's a Hoot. the Butterfly Garden- Pink plates look super cute i would get that! I love the plates. My kids need new plates. I like the Barnyard friends two pack. 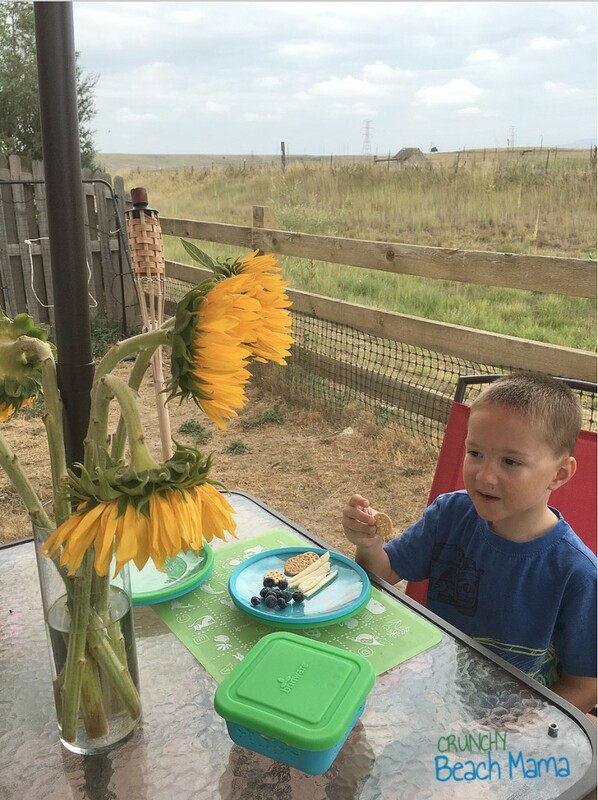 I want Food Storage Container-Garden Party as it would be nicer to have some good containers for my little child as he loves to go on outings and I am a cleanliness freak so I love him to have his own things. And also I would love to have glass containers as they are better to take anywhere and clean. I really like the Brinware Placemats. Those plates would be great! The Catch All Silicone Bib Product is so cute and colorful love to use these. I would like the Multi-Purpose Containers. I like their assortment of storage containers. The blue school of fish plate is really adorable. I like the ABC & 123 Pink and Purple Placemat Set ! I love the barnyard friends red and orange 2 pack! I really like the 2 Pack- It's a Hoot and School of Fish. So cute! My 5 year old would love these. I really like the Food Storage Container-Garden Party. I could see this being very handy for us! I love the design with the silicone protecting the glass! Not a huge fan of the entirely silicone plates they have out there for little kids! Id love the 2 pack of barn plates! I think the fish bowl is cute. It's a hard choice. I would chose 2 of the Food Storage Containers in the School of Fish pattern. Would love the School of Fish storage container and It's a Hoot Pink plate!! Love these products! Been looking for the perfect dinnerware for my growing kids. These seem perfect!! Would love to win some to try!! I think I would like the containers. I love the colors. I think that the 2 Pack- Garden Party Pink and It’s a Hoot Purple is so adorable! I would love to have that for my daughter! I would really like to have the Catch All Silicone Bib - Barn Yard Friends and The Garden Party Bib. They look so durable and I know my little girl would love them. The Panda Play- Blue plate looks very nice!